soapbox, originally uploaded by jahansell. When I was blogging every day without fail, I felt a responsibility to document everything that was happening around town - show up, take photo, post photo. I was so reliable that often the newspaper would call me up to see if I had pictures of an event they missed. 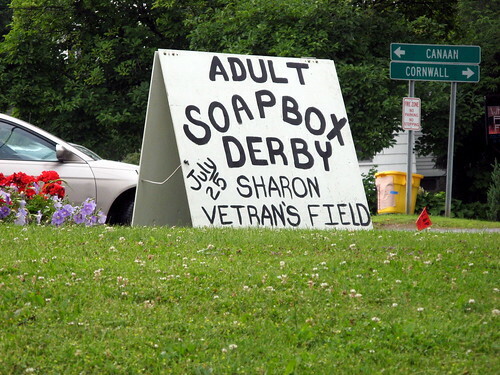 I haven't been able to keep that up - just this week it seems I've missed a lot that's going on around Sharon, like the hospital picnic on Thursday night, and I won't be at the movies at the field tonight either. But I won't miss this - it sounds like a hoot! I wonder how you make a car like that, and how you enter the contest. Anyone know? This sounds like a really fun event! I like that its for adults. Oh, dear - the dreaded spammer: I've been getting that too lately. LOL, I had to remember a "sopbox" is a car made from a box - a billycart! I always associate the soap box with Speakers' Corners and the like - standing up and having your say! Sydney Daily Photo. I’m so busy with a new job I hardly have time to post, much less comment these days!